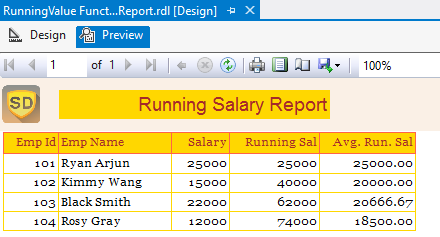 In this SSRS Tutorial, You will be learning How to Fixed Column header in every new page in SSRS to organise and summarise your data in a better manner. We know that Page Break and Fixed header provides a way of managing large amounts of report. After adding Page Break functionality in our report, we will observer that column header is not repeating in every new page. To prevent row and column labels from scrolling out of view after rendering a report, we can freeze the row or column headings. Now, we need to click on the top most group and will do some settings in their properties. So, it is another easy setting in SSRS report to repeat your columns header in every new page with page break functionality. SSRS gives us ability to control whether to repeat row and column headers on every page of a Reporting Services paginated report for a tablix data region (a table, matrix, or list) that spans multiple pages. In the report, Page Break functionality gives a control on the amount of information on each page and can improve the performance of published reports because only the items on each page have to be processed as we view the report. If we try to show all the information on the same page, it will take a huge amount of time because SSRS engine must need to be processed all items before we can view the report. It will open Group Properties window where we need to go in the Page Breaks Section and select Between each instance of a group to add a page break between each instance of a group in the table. Optionally, select Also at the start of a group or Also at the end of a group to specify that a page break be added when a group starts or ends in the table. We know that SSRS supports both on-demand (pull) and event-based (push) delivery of reports where event based delivery of reports is known as Report Subscription. We can easily configure the automatic delivery of specified reports by e-mail or to a file share at scheduled intervals. In this tutorial, we will learn how to subscribe a report at shared file location or directory. SQL Server Agent Service should run. Service account that is using for file share subscription should have read/write access to shared folder. To create the report subscription, we should have "Manage individual subscriptions" or "View a report" permissions. Report must have stored the credential security and used embedded connection instead of shared data source reference. Users who will use these reports must have read only access to the shared folder. Note: The report is delivered as a static file. If the report includes interactive features (for example, links to additional rows and columns), those features are not available. SQL Server Reporting Services comes with many features to visualize your business data. In term of Report delivery, SSRS supports both on-demand (pull) and event-based (push) delivery of reports where users can view reports in a Web-based format or in e-mail. The event based delivery of reports is known as Report Subscriptions in SQL Reporting Services which provides a way to us to configure the automatic delivery of specified reports by e-mail or to a file share at scheduled intervals. 1. Standard Subscription - This subscription is based on the static values for the parameters and could be created by any user having "Manage individual subscriptions" or "View a report" permissions. 2. Data-driven Subscription - This subscription is based on the dynamic values for the report parameters means report parameters are filled from a query (or a database) at the time of report execution. This subscription requires recipient list, delivery method and parameter values needed for each recipient's report execution. To create this subscription, user must have permissions as "Manage all subscriptions” or Content Manager. SSRS provides the facility to create multiple subscriptions for a single report to vary the subscription options; for example, we can specify different parameter values to produce three versions of a report, such as a Western region sales report, Eastern region sales, and all sales. Report delivery is an extensible part of Reporting Services architecture. These subscriptions are processed on the report server and are distributed through delivery extensions that are deployed on the server. By default, we can create subscriptions that send reports to a shared folder or to an e-mail address. For each subscription, we need to configure delivery options and the available options are determined by the delivery extension we choose. A delivery extension is a module that supports some manner of distribution. A pointer to a report that can run unattended (that is, a report that uses stored credentials or no credentials). A delivery method (for example, e-mail) and settings for the mode of delivery (such as an e-mail address). A rendering extension to present the report in a specific format. Conditions for processing the subscription, which is expressed as an event. Usually, the conditions for running a report are time-based. For example, you may want to run a particular report every Tuesday at 3:00 P.M. UTC. However, if the report runs as a snapshot, you can specify that the subscription runs whenever the snapshot is refreshed. Parameters used when running the report. In the report subscription, report parameters are optional and are specified only for reports that accept parameter values. This is because a subscription is typically user-owned, the parameter values that are specified vary from subscription to subscription. For example, sales managers for different divisions will use parameters that return data for their division. All parameters must have a value explicitly defined, or have a valid default value. A Reporting Services subscription is a configuration that delivers a report at a specific time or in response to an event, and in a file format that we specify. Subscriptions can be used to schedule and automate the delivery of a report and with a specific set of report parameter values. "Subscriptions cannot be created because the credentials used to run the report are not stored or if a linked report, the link is no longer valid" is the very generic error in SQL Server Reporting Services. This error occurs because SSRS requires a Login to connect to the data source to process the report whenever subscription will be occurring at its scheduled time. If you are creating your report with the shared datasource and your datasource is built up on the Use Windows Authentication (Integrated security) as given below image then you will not able to create subscription on that report and will face the above error. Shared Data Source is not allowed in Report Subscription and before creating subscriptions, scheduled report needs to know which credentials we want to run with, when producing the reports. If you want to create report subscription on the report then I would recommend you to store the credential security into report level and use embedded connection instead of shared data source reference. To sort out this issue, we are doing the following settings step by steps. 6. After testing the connection string, click on Save button. Choose the Subscription, where you can see the enabled New Subscription. After following the all the above steps, you are able to create "New subscription" or "New Data-driven Subscription" with the help of report manager. What is MAXRECURSION hint in Recursive CTE? The statement terminated. The maximum recursion 100 has been exhausted before statement completion. If the MAXRECURSION query hint is not specified, the default limit is 100. When the specified or default number for MAXRECURSION limit is reached during query execution, the query is ended and an error is returned. MAXRECURSION hint allows us to specify how often the CTE can recur before generating an error. MAXRECURSION hint is very helpful in a scenario where poorly written CTE is resulting in an infinite recursion level; in such cases MAXRECURSION terminates the CTE once the defined recursion crosses. MAXRECURSION 0 allows infinite recursion. While creating VIEW do not use this clause but whenever you are executing the VIEW use it there instead. To understand the worth of MAXRECURSION hint, we are taking a recursive example for employee data which is just a sample to avoid max recursion error. In this query, we have to use hint (MAXRECURSION 200) or hint (MAXRECURSION 0) and see the behavior of the CTEs queries. The MAXRECURSION query hint specifies the maximum number of recursions allowed for a query. The number of recursions is a non-negative integer between 0 and 32,767. When 0 is specified, no limit is applied. Expression - The expression on which to perform the aggregation, for example, [Quantity]. Function - (Enum) The name of the aggregate function to apply to the expression, for example, Sum. This function cannot be RunningValue, RowNumber, or Aggregate. Scope - (String) A string constant that is the name of a dataset, data region, or group, or null (Nothing in Visual Basic), that specifies the context in which to evaluate the aggregation. Nothing specifies the outermost context, usually the report dataset. Return Type - Determined by the aggregate function that is specified in the function parameter. The most interesting thing is that the value for RunningValue resets to 0 for each new instance of the scope. If a group is specified, the running value is reset when the group expression changes. If a data region is specified, the running value is reset for each new instance of the data region. If a dataset is specified, the running value is not reset throughout the entire dataset. We cannot use RunningValue for the filter or sort expression. The set of data for which the running value is calculated must have the same data type. To convert data that has multiple numeric data types to the same data type, use conversion functions like CInt, CDbl or CDec. Scope parameter cannot be an expression. Scope for nested aggregates must be the same as, or contained by, the scope of the outer aggregate. For all distinct scopes in the expression, one scope must be in a child relationship to all other scopes. Scope for nested aggregates cannot be the name of a dataset. Expression must not contain First, Last, Previous, or RunningValue functions. Expression must not contain nested aggregates that specify recursive. How does RunningValue Function Work? This function is very useful to calculate on the fly calculation such running sales with the month, within the year or within the product specific. It gives us to facilitate to use the aggregate functions to calculate the different type running aggregation values. It has some limitation such as sorting and filtering data.